What is the concept of veil (hijab) in Islam? Who are leaders of congregational services? How does the Islamic concept of God differ from other religions? What are the ways of establishing meaningful relationships with God? Does Islam oppress dhimmis and demand jizya or death? In this book (written and published in 1891 CE), Hadhrat Ahmad (as) first makes mention of the efforts that the Christians were making at that time to convert the Muslims to their own faith. He remarks that the darkness has prevailed and disorder has become the order of the day. Good deeds are derided and poisonous ideas are being infused into the minds of people. He pointedly makes mention of the teachings of Christianity, which are like mines to blow up righteousness and piety and announces to the people all over the world that he has been sent by God to counter all these evils. He asks the Muslims if they do not think that it was necessary that in such circumstances, a godly man should have come to help them and the world at large. He claims that he is the one who has been sent at the most appropriate time to correct the wrongs, to revive the religion and to establish it in the hearts of the people. As for the sacrifices that would be needed, he says that the revival of Islam demands a sacrifice from us and that sacrifice is that we should give our life for it. To write books for publication and distribution. To issue posters and handbills. To entertain those who come to Qadian for further understanding. To write letters to the people in different parts of the world. To organise those who are initiated into the field. To assure the people that it was essential to believe in him, he says that he who leaves him, leaves Him who has sent him, and he who joins him, joins the One Who has sent him. He further says that he has a lamp in his hand and he who comes to him will partake of the light of that lamp, but he who flees away from him because of suspicion and doubt will be thrown into the darkness. He says that he is the well-secured fort and whoever enters this fort will save his life from falling into the hands of the robbers and dacoits but he who stays away from his four walls will have to confront death from all sides and even his dead body will not be left intact. Hadhrat Ahmad (as) then makes mention of his very close followers, among them Maulvi Hakim Nur-ud-Din who, on the demise of Hadhrat Ahmad (as), became his first successor. He also mentions with great affection and admiration Sheikh Mohammad Hussain Muradabadi, Hakim Fazlud Din Bherwi and Mirza Azim Beg. 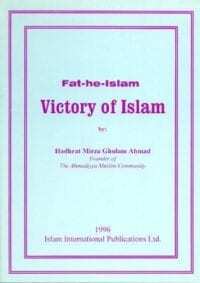 At the close of the book Hadhrat Ahmad (as) has made an announcement to the effect that all those who would like to ask any questions or who have any objections against Islam, the Holy Qur’an and the Holy Prophet (sa), or against himself (Hadhrat Ahmad (as)) or his claims or the work that he is doing, should write to him and seriously and sincerely ask for his answers. He tells them in this announcement that he will publish their questions or objections with his answers in a book form.